Sonibare, Mubo Adeola; Soladoye, Micheal O.; Esan, Oyedokun O. & Sonibare, Oluwadayo O. The in-vitro antimicrobial evaluation of ethanol extracts of four species of Cola Schott & Endl. was done using human isolated strains of Staphylococcus aureus , Staphylococcus albus , Bacillus subtilis , Klebsiella pneumonia , Pseudomonas aeruginosa , Candida albicans , Aspergillus niger as test organisms. The assays were carried out by agar well diffusion, erythromycin and ketoconazole served as the control drugs. The leaf ethanol extracts of the plants were found to be more effective against the tested fungi than the bacteria at high concentrations. None of the extracts was active against Staphylococcus aureus. Plant extract of C. acuminata (P. Beauv.) Schott & Endl. and C. nitida (Vent) Schott & Endl. showed activity on S. albus at concentrations ranging from 10-150 mgml-1 having comparable diameters of zone of inhibition of 7.3±0.03-16.0±0.0 for C. acuminata and 10.0±0.0-19.0±0.0 for C. nitida. Also, these two species of Cola demonstrated activities on C. albicans and A. niger at concentrations ranging from 90-150mgml-1 with relatively close diameters of zone of inhibition. Only C. acuminata inhibited the growth of K. pneumoniae at the MIC of 90mgml-1 whereas, C. albicans was inhibited by C. acuminata, C. millenii K. Schum and C. gigantea A.Chev. at the MIC of 120mgml-1. Phytochemical screening of the four species of Cola showed the presence of alkaloids, saponins, tannins and cardenolides in all the plants which apart from showing the probable closeness of the species could also be responsible for the observed activities. 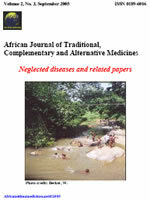 The antimicrobial property shown by the plant extracts is an evidence of the ethnomedicinal uses of the plants. The similarity observed in the phytochemical constituents and antimicrobial activities demonstrated by C nitida (Vent.) Schott & Endl., C. millenii and C.gigantea A. Chev. and C. acuminata suggest a probable closeness among these species. The results obtained in this study provide preliminary evidence of the chemotaxonomic significance of secondary metabolites and antimicrobial activities in infra-generic taxonomy of species of Cola. Cola species, Sterculiaceae, phytochemical screening, antimicrobial studies, taxonomy.